It’s easy to get excited if you’re a Dodgers fan in L.A. and you’ve watched what has happened so far this season. We’re a week in, and the Dodgers own the best record in baseball. But now comes the wet blanket: The Dodgers just spent seven games beating up on the Padres and Pirates. Over 162 games, the Dodgers will eventually have to battle the D-Backs in the desert, match up against Roy Halladay (probably), and deal with Joey Votto, Ryan Braun, and other National League superstars. But for now, they’ve landed the friendliest early slate in baseball, with three matchups at home against those same undermanned Padres this weekend to cap a 10-game cakewalk. 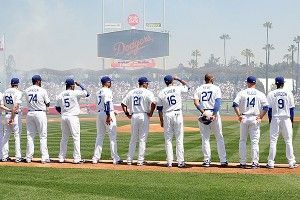 When the hosannas start raining down on Chavez Ravine on Monday morning after a 9-1 or 8-2 start, we should remember that schedule matters this early in the season, that many of the unlikeliest hot-starting teams of recent years also beat up weak opponents early on, and that most of those teams eventually crashed back to earth. Forty games into last year, the Rockies were the NL West’s unlikely leaders at 22-18. Of those 40 games, all but five were played against teams that would miss the playoffs. The hottest stretch was April 5-17, when the Rockies went 11-2 against the Dodgers (82-79), Pirates (72-90), Mets (77-85), and Cubs (71-91). Colorado would end the season at a lowly 73-89. Occasionally, the effects of scheduling can carry for a longer stretch, even past the All-Star break. Of the Cleveland Indians’ first 24 games last season, exactly zero were played against teams that would eventually make the playoffs; only six — three-game sets against the Red Sox and Angels — even came against clubs above .500. Buoyed by that soft slate, Cleveland roared to a 16-8 start. Though the schedule evened out in a hurry, the Indians continued to thrive against bad teams, even as the losses piled up against tougher competitors. Cleveland held a share of first place all the way until July 20, going 31-18 against sub-.500 clubs but just 20-28 against teams .500 or better. A surge by the Tigers knocked the Indians out of contention, and Cleveland’s late-season swoon shrank the team’s record to 80-82 by year’s end. There are many, many more examples of this trend over the years. In 2010, the A’s ran out to an early AL West lead by playing their first 14 games against sub-.500 teams, including seven against a Mariners team that would eventually lose 101 games. After that 9-5 start, they went just 72-76 the rest of the way, finishing the year nine games back of front-running Texas. Spend some time on Baseball-Reference.com and you’ll find scads of similar examples of fast starters falling to pieces once they start playing teams that don’t stink. Happens all the time. A couple of other teams have followed the same blueprint this season. The Nationals are 5-2 after playing six of their first seven games against the Cubs and Mets, and Texas is 5-2 after whacking the White Sox and Mariners. We don’t know for sure that the Padres, Pirates, Cubs, Mets, White Sox, and Mariners are lousy ball clubs, just as we can’t be certain yet which teams are the league’s best. But those six teams were nearly unanimously projected to finish below .500 this season by various pundits and projection systems. This also isn’t to say that the Nationals, Rangers, and Dodgers aren’t potentially good teams this year. The Rangers in particular are regarded as a top contender and a threat to win a third straight AL pennant, and the Nationals did get some love as a sleeper pick. It’s not like the Dodgers are devoid of talent, either. Matt Kemp has picked up where he left off last year, laying waste to NL pitching. Andre Ethier is healthy and hitting again. The great Clayton Kershaw has fanned 10, walked just one, and allowed only one run over his first 10 innings of the season, despite trying (and failing) to battle through a stomach flu in San Diego. Maybe Mark Walter and his $2.15 billion compadres get a big, pleasant surprise in year one of their reign. But there are reasons why we keep harping on the misleading nature of small sample sizes, and schedule is one of the biggest. There are few immutable rules in baseball, but here’s one: When you beat a team with a middle of the order of Casey McGehee, Yamaico Navarro, and Clint Barmes, you’ve got more work to do before people should think you’re for real.